"A research lab, in every house, will be the marking of a new philosophical age!" Sir Kevin II exclaimed, standing on a small podium, in front of a large audience. The crowd applauded, rising to give standing ovations. "Over the top," Jessica commented, as they headed backstage to rest. "Not at all," Kevin responded, wiping his face with a towel. "This isn't just about making toys and utensils anymore, Jessica. We can make a difference, with our organisation," he emphasised. "We already are," Jessica sat down for her mug of hot coffee and smiled to herself. Kevin was not always so ambitious. They had both seen hard years of little funds and no support from others, before they finally made it big. Well, as big as any small successful group. Not rich, anyhow. In the meanwhile, another organisation was forming its first branch. A group of young and learned activists, with their hands on the beating pulse of society. "In hell," James began, sitting down, holding a bottle of unlabeled homemade beer, "nothing has a price tag." "In hell, nothing has a price tag?" The second James, James Mallorie, wondered aloud. "How did you reach that conclusion?" He asked, and turned to look at the first James. "Entire industries are shutting down. The markets are becoming desperate. People are losing jobs," James finished, and examined each face in the circle of chairs about him. They all seemed... Interested... But maybe not in the same topic, that was all. "But new jobs are being made. People are becoming more free, to do what they wish with their lives," Mallorie played the devil's advocate, smiling as he spoke. "I wasn't saying it's evil," James responded reasonably. "Only that we should tread more carefully with this new technology. Ask more question, and make sure we don't go around hurting people, right?" The circle nodded in consensus. 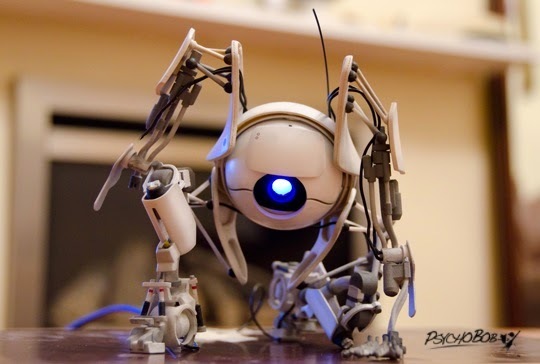 Atlas from the game Portal, made with a 3D Printer, by Psychobob. Personal Creator Lab, commonly referred to as PCL, had become a household brand. In modern society, at the edge of technology, there was hardly a house or apartment without such a device. Simply speaking, it was a small automated factory; suitable for the needs and resources of an individual. With a minimal investment, any random Joe could now purchase the machine, buy the necessary materials, buy or find the plans for whatever it is they wanted to make, and in the push of a button, it was made. Modern age magic! Kevin and Jessica, departing from their plane and on route to their hotel, inhaled the fresh moist air of the Mexican jungles. "Printing Malaria medicine and all sorts of drugs," Jessica began saying, ducked a low branch and continued, "those drugs will make the third world seem like paradise." "Paradise," Kevin echoed. "Enter paradise, by pressing a button," he grinned, his eyes reflecting dreams and ambitions. Jessica looked at her mobile, and heard the news in one ear: "Political activist groups calling for regulation of PCLs," and, "Congress discussing a new law that would require printing permits and licensing, that may limit what and how much each person can print." She moaned silently. She should not bother Kevin with such nonsense. Politics is not what they do, anyway.